More than ever before, we need cleaner energy...like natural gas. Every year, billions of dollars worth of natural gas are wasted; burned or flared at oil fields across the world. Such flaring produces some 400 million tons of greenhouse gas emissions. Major oil companies and governments are now working together to minimize this waste by jointly overcoming the barriers that inhibit more gas utilization. 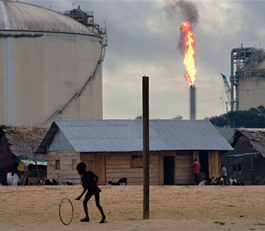 Join the global effort to reduce gas flaring. 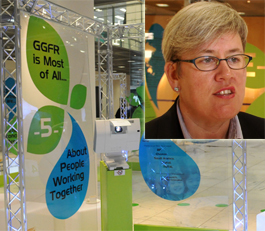 VP Rachel Kyte talks about the importance of reducing gas flaring at a Forum that marked GGFR's 10th anniversary. The event brought some 200 representatives from major oil-producing countries and companies, and was hosted by the EBRD in London. Action by Global Gas Flaring Reduction partnership cuts emissions. Once wasted, natural gas now provides power. World Bank calls for “raised ambition” to cut flaring worldwide by another 30%. Over the past six years, flaring of gas associated with oil production has dropped worldwide: from 172 billion cubic meters in 2005 to 140 bcm in 2011, according to latest data from satellite estimates. The World Bank’s GGFR public-private partnership was launched at the World Summit on Sustainable Development in Johannesburg in 2002. GGFR supports the efforts of oil producing countries and companies to increase the use of associated natural gas and thus reduce flaring and venting, which wastes valuable resources and damages the environment. The GGFR partnership is a catalyst for reducing wasteful and undesirable practices of gas flaring and venting through policy change, stakeholder facilitation and project implementation. 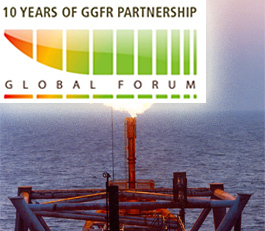 GGFR partners have established a collaborative Global Standard for gas flaring reduction. This Global Standard provides a framework for governments, companies, and other key stakeholders to consult with each other, take collaborative actions, expand project boundaries, and reduce barriers to associated gas utilization. The GGFR partners include: Algeria (Sonatrach), Angola (Sonangol), Azerbaijan, Cameroon (SNH), Ecuador (PetroEcuador), Equatorial Guinea, European Bank for Reconstruction and Development (EBRD), France, Gabon, Indonesia, Iraq, Kazakhstan, Khanty-Mansijsysk (Russia), Mexico (SENER), Nigeria, Norway, Qatar, the United States (DOE) and Uzbekistan; BP, Chevron, ConocoPhillips, ENI, ExxonMobil, Marathon Oil, Maersk Oil & Gas, Pemex, Qatar Petroleum, Shell, Statoil, TOTAL; European Union, the World Bank Group; Associated partner: Wärtsilä. The GGFR team facilitates demonstration projects for associated gas utilization by establishing partnerships between the relevant stakeholders. International experience shows that effective enforcement of regulations and the provision of the right incentives are crucial to reducing flaring. The role of carbon finance is to ensure that developing countries and economies in transition are key players in the emerging carbon market for greenhouse gas emission reductions.